The little one has been drinking Nestle NAN ever since she weaned off breastmilk when she hit 1. 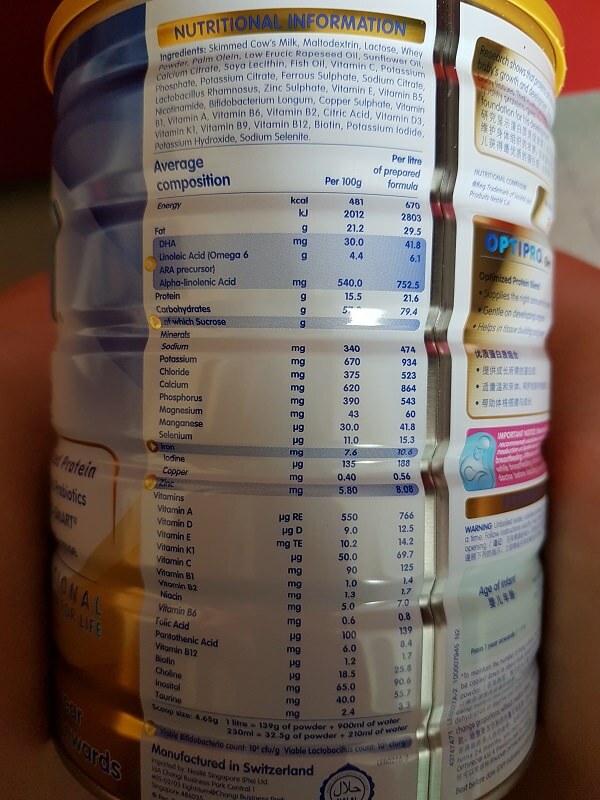 As most know, formula milk powder sold in Singapore is ridiculously expensive, ranging from $30-40 a tin (based on Stage 3 normal formula 800-900g tin). There have been efforts by the Government to introduce more affordable formula milk brands but so far there hasn’t been much results. Perhaps it is true that the formula milk companies have been excellent in their “brainwashing” techniques because even I believe that NAN is better than the Fairprice brand. The hubby first tried to get me to change to a cheaper brand of formula milk but I managed to fend him off by saying that Emilee is fine with NAN. I didn’t want to change brands and risk having her get constipated. Then, hubby changed tactics and urged me to look at NAN sold overseas while we were holidaying in Australia. Again, I managed fend him off after checking out the ingredients in the Aussie NAN. It seemed like Aussie NAN is so much cheaper but that is also because it lacks in nutrients and minerals as compared to Singapore’s NAN. Finally, hubby asked me to compare Malaysia’s NAN with Singapore’s. Save for a slight difference in levels of certain nutrients and minerals, Malaysia’s NAN is quite similar to Singapore’s. A tin of Singapore NAN 3 and a box of Malaysia NAN 3. We had planned for Emilee to slowly switch to fresh milk as soon as she hit 2, but so far we haven’t been successful. So she’s still on NAN. I was quite reluctant to switch to Malaysia’s NAN initially, but hubby reasoned that she would have been drinking fresh milk already so it shouldn’t be too bad. Fair enough. Moreover, a 1.3kg box of NAN 3 in Malaysia costs about RM86 (we got ours on discount for about RM75) which is about SGD25 after conversion. SO MUCH CHEAPER THAN A 900g TIN IN SINGAPORE! A 900g tin of NAN 3 in Singapore costs about SGD36 (about SGD30 when bought in bulk). Even with the cost savings, I was still a little unsure about switching to Malaysia’s NAN. I did more comparisons and this is what I found out. Singapore’s NAN 3 is meant for kids after 1 year old. They should switch to NAN 4 when they turn 2. However, Malaysia’s NAN 3 is for kids up to 3 years old. If you find this queer, it is actually unique to Singapore’s NAN. Most other Stage 3 brands also last until 3 years old. 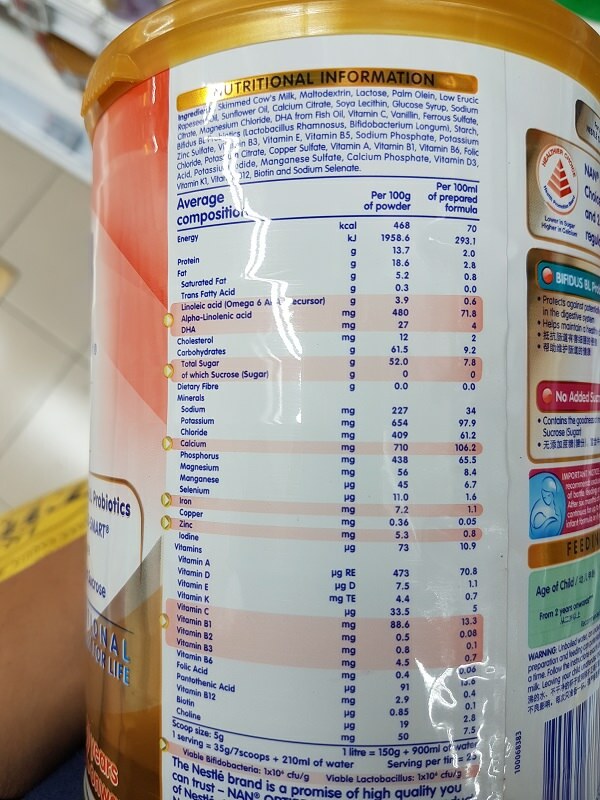 List of ingredients in Singapore NAN 3. List of ingredients in Malaysia NAN 3. 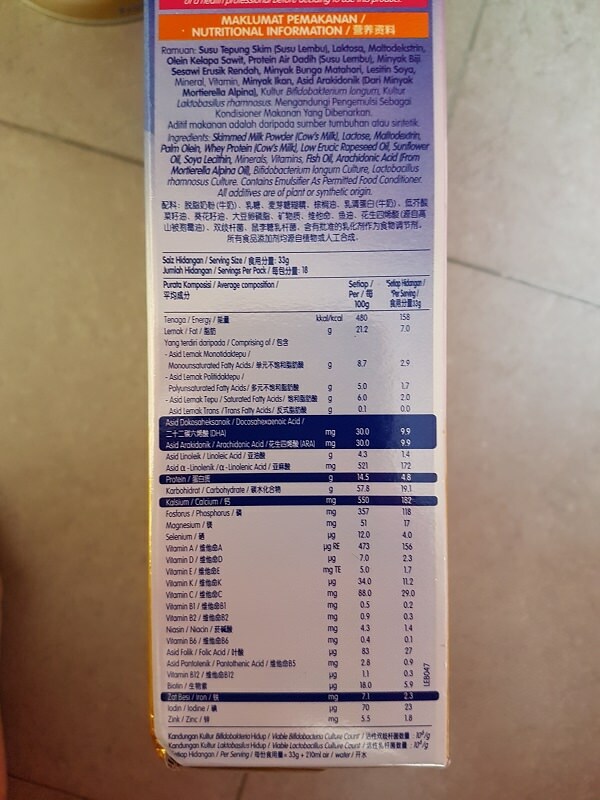 List of ingredients in Singapore NAN 4. The levels of nutrients and minerals differ slightly but the most glaring difference (or at least what I deem most important) is the difference in calcium levels. 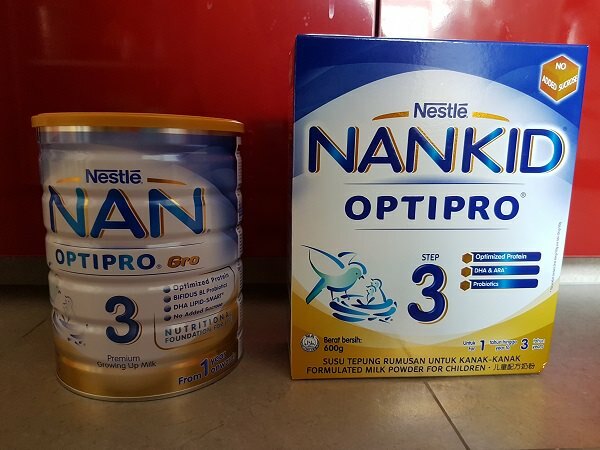 It seems that Malaysia NAN 3 lacks in calcium (550mg per 100g of powder). Singapore NAN 3 and NAN 4 is at 620mg and 710mg respectively. I guess a 2-3 year old would be getting enough calcium and nutrients from other food sources so there shouldn’t be too huge a problem. In terms of appearance and smell, the Malaysia NAN does not differ too greatly. It is not as fragrant as Singapore NAN but it is not too far off. Emilee isn’t too fussy with taste and she took to it easily. She has been on Malaysia NAN for about a month now and there’s no change in her poo routine. We’ve just bought our second batch of Malaysia NAN. If you’re able to look past the above differences, then do consider getting Malaysia NAN for the cost savings! PS: Do note that AVA does have certain guidelines for formula milk sold in Singapore. I suppose that’s why the levels of nutrients and minerals differ country to country.